Los Angeles is known for having one of the biggest Salvadoran communities outside of El Salvador itself. The bustling Salvadoran culture has been growing in LA since the 1980's, when many of them emigrated to the US during the civil war that took place in El Salvador from 1980-1992. The emergence of Salvadoran tradition is one of the best things to have happened in Southern California, because with it comes...Salvadoran food! However, Los Angeles is not the only city known for Central American cuisine. When you venture outside of LA, you'll find many nearby cities keeping the traditions alive by providing for your Salvadoran food needs, and one such city is Lancaster. The city of Lancaster is located in Antelope Valley and approximately 60 miles north of downtown Los Angeles. Picture this: you're on a road trip near Los Angeles and you pass through Lancaster. You're starving and you know, deep in your heart, that there are pupusas somewhere nearby just waiting to be devoured. And then you see it - Pueblo Viejo Restaurant. But what do you order first, besides pupusas? If you're not sure what to order, don't worry - I'm here to shed light on the art of eating Salvadoran food near Los Angeles! Starting with a popular Salvadoran appetizer, yucas are like the french fries of the Salvadoran food group. Yuca is a starchy cassava root that is sometimes confused with potato, and the fact that it's served in long strips and fried like french fries often adds to the confusion. The strips are served with fried pork known as chicharrón, and topped with a cabbage vinaigrette slaw called curtido. The curtido is then drizzled in a red tomato sauce for good measure. Yuca can also be steamed depending on your preference. Steamed yuca has a lighter texture, and is not as crunchy as fried yuca. 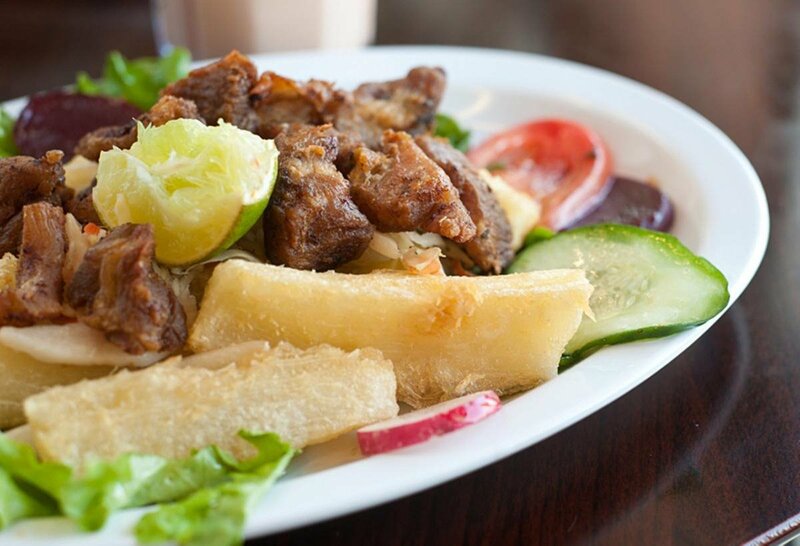 Whether fried or steamed, yuca is a great side dish that you can find at most Salvadoran restaurants, such as Pueblo Viejo Restaurant in Lancaster. Another beloved staple of every Salvadoran menu is platanos con frijoles y crema, which translates to "plantains with beans and cream." This isn't your ordinary sour cream - it's saltier than what you're used to, balancing out with the sweetness of the fried plantains. When you mix the refried beans with the cream, you'll quickly learn why "frijoles con crema" is one of the great joys in life. Fried plantains with beans and cream are one of the most common breakfast meals among Lancaster’s Salvadoran community. 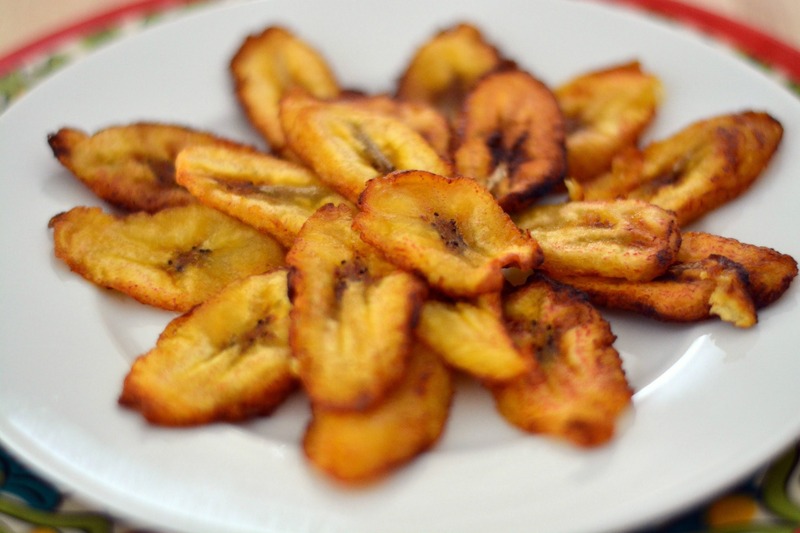 If you order fried plantain as a side dish, I recommend saving it for last due to its sweet taste. Many Latin American cultures have distinct ways of making tamales. For example, Salvadoran tamales are different from Mexican and Cuban ones. Salvadoran tamales are wrapped in green plantain leaves, making them distinguishable from Mexican tamales, which are often wrapped in corn husks. They are boiled instead of steamed, which makes them more soft and moist than their Mexican counterparts. Stuffing options range from pork to chicken, but the most popular stuffing is sweet corn, otherwise known as "tamal de elote." Other typical ingredients include green olives, green beans and potato. 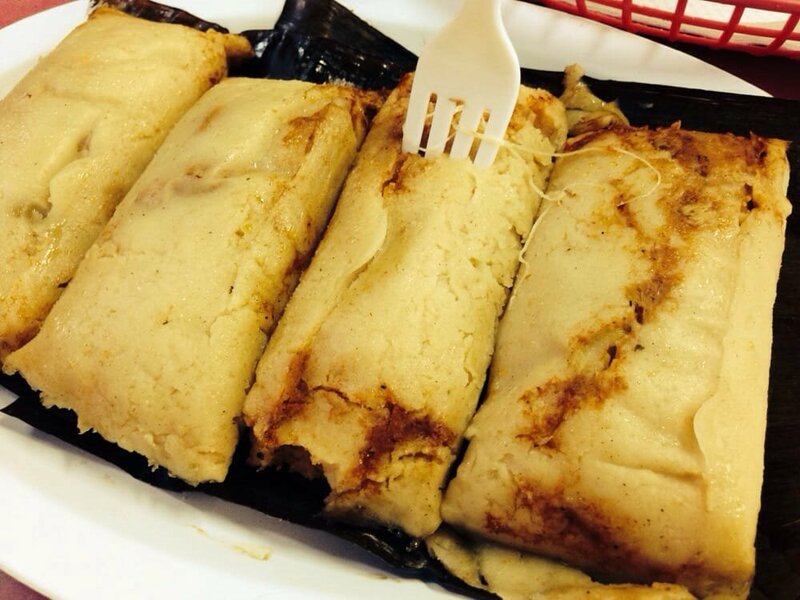 Sweet corn tamales are also a breakfast staple among Salvadorans, especially during the holiday season. Tamal de elote is one of the most requested dishes at Lancaster’s Pueblo Viejo Restaurant. 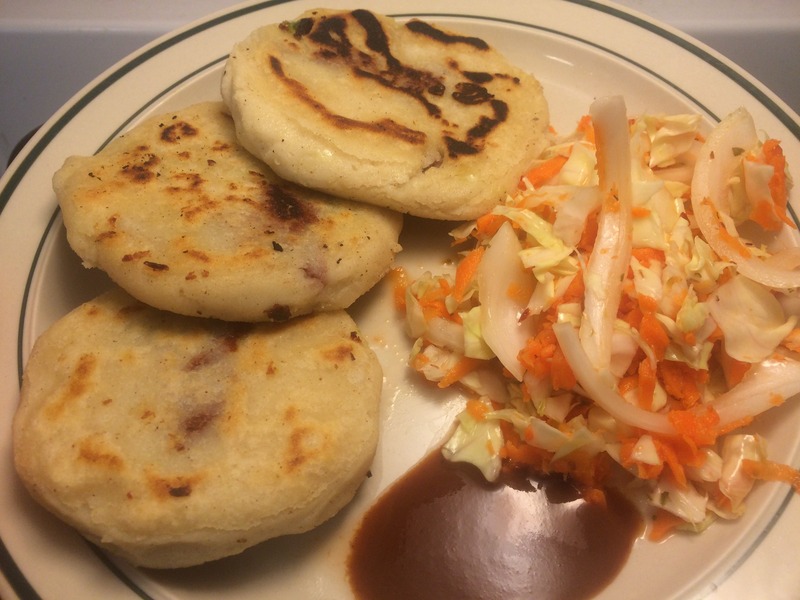 Possibly the most famous Salvadoran meal, pupusas are a great appetizer or side dish. They are made of corn flour and resemble homemade tortillas at first glance, but the magic is in the stuffing. Options come in several varieties. The three most common flavors are cheese, pork (ground with mixed peppers) or refried beans. The pupusa revuelta is the mother of all pupusas, because it includes all three options in one tasteful explosion. Alternative stuffing options for pupusas include shrimp or loroco, which is an edible flower that is native to Central America. Pupusas, like yucas, are served with the cabbage vinaigrette slaw curtido and red tomato sauce. You can accompany your meal with Salvadoran drinks such as horchata or Cola Champagne, a sugarcane soda with a unique flavor. Next time you're on a road trip near Los Angeles and are ready for a lunch break, there are numerous Salvadoran restaurants available to satisfy those hunger pangs. 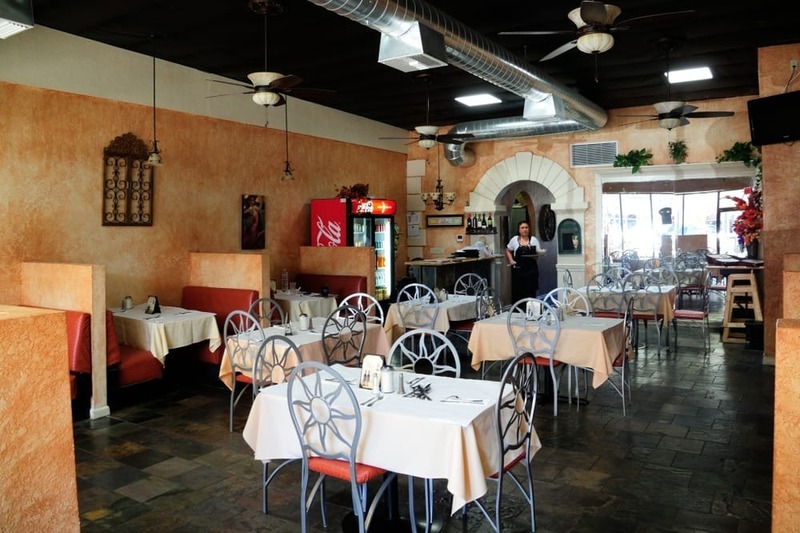 Pueblo Viejo, for example, is located in Lancaster and provides all of the dishes mentioned above, plus more. 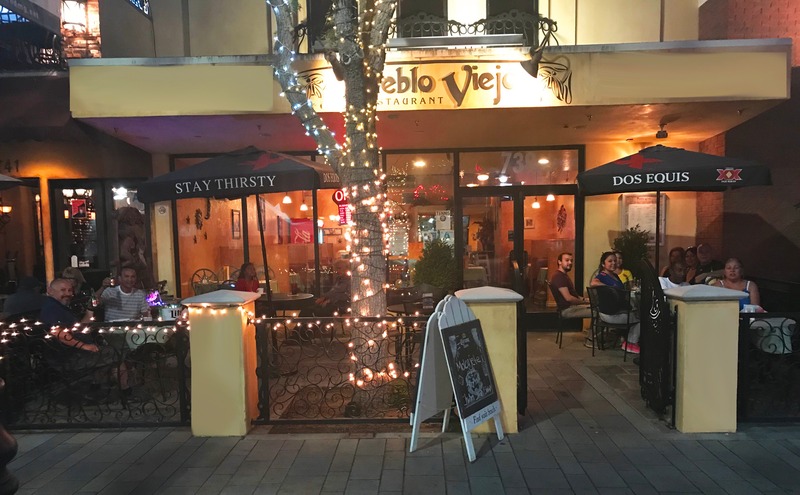 For those who aren't ready to venture out of their comfort zone, Pueblo Viejo Restaurant also has a Mexican food section on their menu. When you're ready to try Salvadoran food, or if you're already a fan, visit Pueblo Viejo Restaurant on Lancaster Boulevard! Pop Up Restaurants like those in Los Angeles are popping up all over the world.